The start-up phase of a library makerspace is exciting. It involves innovation, breakthroughs, and a ribbon cutting event. But what happens in the years after it has launched? What are the elements that define this “post-emergent” phase? This is what five libraries from the YOUmedia Learning Labs Network were asking themselves in 2015 when they got together to do action research, identifying common problems of practice, and creating a framework that describes the post-emergent moment. This framework, and its related case studies, is a tool to guide similar library makerspaces, as they identify this phase for themselves. This project was made possible in part by the Institute of Museum and Library Services, grant number LG-00-14-0186-14. Thanks to the National Writing Project for program guidance and technical support. Our five labs are all part of the YOUmedia Learning Labs Network, started in 2011 with support from the MacArthur Foundation and the Institute for Museum and Library Services (IMLS). Our Network, hosted by the National Writing Project, consists of labs in thirty libraries, museums, community centers, and school settings, dedicated to equity and digital inclusion, and who continue to share programs and engage in national conversations and professional development on the IMLS-funded Community of Practice. Having been built on the YOUmedia Network’s foundation of connected learning and HOMAGO and with the philosophy that youth are best engaged when their interests are prioritized and cultivated by program staff and administration, the Post-Emergent Library Makerspaces Project allowed for us to surface the issues that many libraries (and museums) were facing after opening their labs, but had not yet defined. We began our gatherings and action research in earnest in late 2015. We met online monthly to compare data and observations, then gathered in August 2016 to surface what we had identified as post-emergent themes that emerged across labs. We presented initial findings at the Digital Media and Learning conference in October 2016 in Irvine, CA. Action research is a research methodology rooted in practice. It involves self-reflective inquiry and a practitioner doing their own research on their current work. Generally it involves a cyclical pattern of data collection, action, evaluation, modification or adjustment, then begins again. For many libraries, it’s a new experience to include mentors and “frontline” staff into a research project alongside library administrators, who in turn often don’t get an opportunity to think about practice on the floor. Our action research approach also surfaced data and measurements beyond turnstile clicks to think about the institution’s impact on teaching and learning. The YOUmedia Learning Labs Network believes that access to high-quality educational experiences is a basic right of all learners and a cornerstone of equity. We work in partnership with institutions, organizations, and communities nationally to develop and sustain leadership for educational improvement. YOUmedia Learning Labs are centered around production and guided by a core philosophy that youth are best engaged when they are discovering and following their passions, collaborating with others, and being makers and doers. The National Writing Project, our network host, has a long history of teacher led-professional development driven by action research and inquiry. As a peer-supported community of practice, bringing together educators across grade levels and disciplines, both in and outside of school, with a focus on literacy and connected learning, the NWP provides technical support and program guidance for this project. Through our research we identified four common themes that describe the post-emergent phase of a library makerspace: Getting to Geeking Out, Finding Your Place, All Hands on Deck, and Running a Tight Ship. These themes, which each contain identified problems that we as post-emergent library makerspaces experienced, constitute a framework that can help your library to identify whether or not it is in this phase of development. The case studies within describe how we tested, iterated, and worked through our problems of practice. The most exciting part of developing this framework was our own involvement in identifying challenges both in our local context, having them validated through observation and data sharing with each other, and having the support to take action and improve our programs. This framework now gives us a way to talk about this phase of a program’s development; it’s become our most powerful tool. How can we get youth in our spaces to engage beyond the “hanging out” and “messing around” phase of HOMAGO? How can we design programs and spaces to encourage youth to dive more deeply in expert programs? The case studies in Getting to Geeking Out include developing project-based programs, dedicated program times in the space, and more. How does a teen makerspace program relate to, and integrate with other more established departments in your library, like the children’s and adult department? And on a wider level, how does your program fit within the scope of your community and partner organizations? How does it relate to and learn from other similar library programs nationally? Finding Your Place describes the challenges around defining who you are and what services you provide, within your library and within your community. When you’re running a really great program that’s getting a lot of attention, the first thing your library administration is going to expect is for you to spread the wealth through bringing your program to more branches, doing outreach, holding professional development opportunities, and more. Unfortunately, that expectation doesn’t always include adding more capacity, whether staff, resources or the like. All Hands on Deck is about the pressures we identified related to expanding program and supporting limited staffing capacity. What are the processes you need to have in place to enable the youth you serve, and your frontline staff, to thrive? We identified the Running a Tight Ship theme when we discussed the challenges around providing relevant youth programs, expanding our programs, and supporting new administrative leadership and capacity building. We were fortunate to build on the well-established knowledge base of action research and practitioner-led inquiry that the National Writing Project has built over the past 40 years. This included the simplest of methods: us all making a commitment to regularly collect data through observations and journaling, then mining that data for patterns locally with our libraries and staff, and then having regular conversations (conference and video calls) with other labs to help narrow down and identify our problems of practice. The Making + Learning framework, Children’s Museum of Pittsburgh. We presented on this work (with a work-in-progress framework) at the 2016 Digital Media and Learning Conference at the University of California at Irvine.Our session was called Blazing the Trail: Action Research and “Post-Emergent” Library Makerspaces. You can also read an article about this project and our thoughts and challenges that went along with it on our network’s website, youmedia.org. The Studio, Anythink Libraries (Rangeview, CO) serves the residents of Adams County, Colorado through its seven branches and bookmobile. 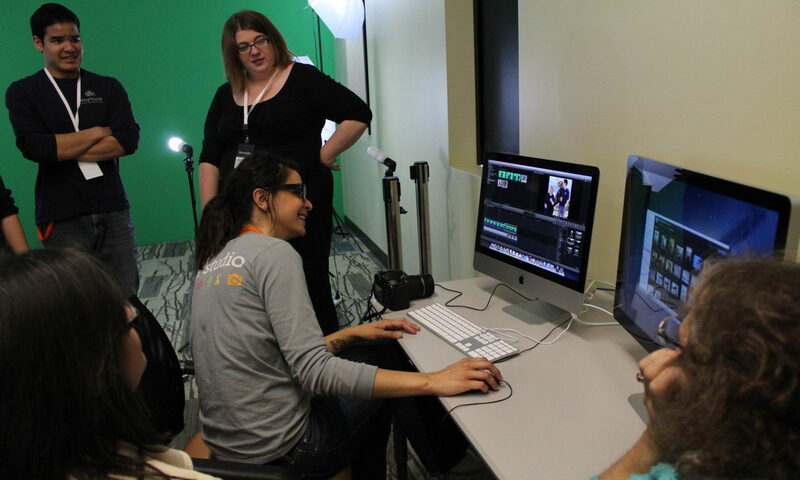 The Studio is Anythink’s hub for hands-on, participatory programming. T.E.C.H. Lab, Billings Public Library (Billings, MT) serves Yellowstone County with one main library in Billings, one bookmobile, and a senior outreach van. QuaranTEEN, Lynn Public Library (Lynn, MA) provides tech and maker programs for teens in grades 6-12. The Labs, Carnegie Library of Pittsburgh (Pittsburgh, PA) a resource for youth providing mentorship around media and making in the library. Maker Jawn, Free Library of Philadelphia (Philadelphia, PA). A 5-branch initiative within a 54 location urban system, with a staff of 10 and a part-time program coordinator.